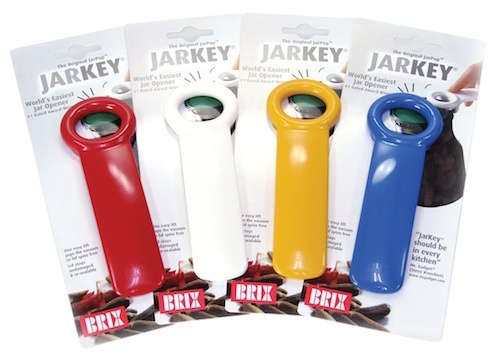 The Original JarPop JarKey by Brix, one of HIC, Harold Import Co.’s brands, was recently chosen as a recommended pick by Cook’s Illustrated, receiving three stars for comfort, and three stars for ease of opening. The review, which appeared in the July/August 2015 issue, involved testing of seven jar openers on jars of all shapes, sizes, and materials to find the best all around pick. To read the Jar Openers review in the July/August 2015 issue, visit Cook’s Illustrated online. JarKey is often referred to as the World’s Easiest Jar Opener due to its patented design that fits all traditional preserving jars. 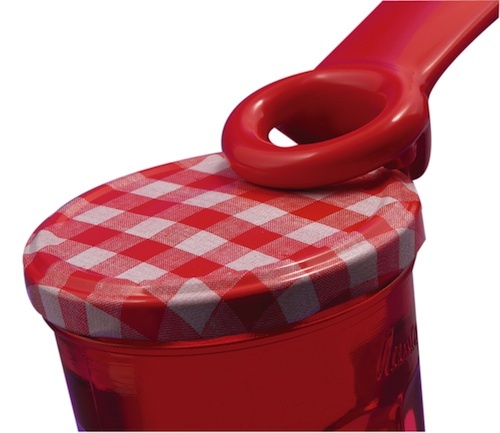 It quickly and effortlessly pops the vacuum seal, making it easy to open the lid with no twisting or gripping. 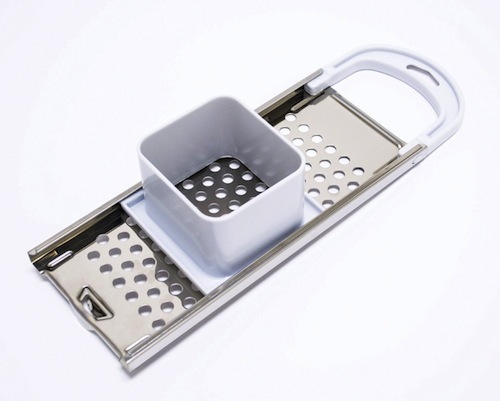 The unique design features a special three-point principle that ensures the vacuum is released, allowing for a gentle lift without damaging the lid. It is made of high density ABS plastic and has has no sharp edges or points or moveable parts. Fits all traditional preserving jars. Available in an array of fun colors, included frosted. Cook’s Illustrated/America’s Test Kitchen (ATK) is constantly in search of products that offer the best value and performance. As part of their testing process, ATK strives to figure out why one product is better than another, and to explain that reason to its readers. Because they accept no advertising, Cook’s Illustrated provides completely unbiased, no-nonsense product reviews. In the near future, Christopher Kimball, founder, America’s Test Kitchen, will appear on the The Rachael Ray Show talking about his favorite gadgets, including the JarKey. Air date is yet to be released. This entry was posted in Useful Tools and tagged kitchen accessories, kitchen gadgets, kitchen utensils, useful tools on October 6, 2015 by HIC, Harold Import Co.. 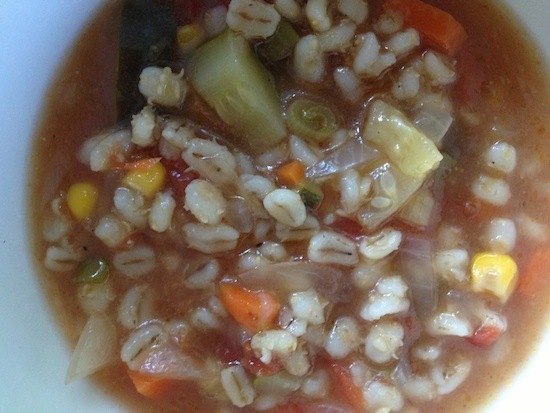 The weather is turning chilly, and that means it is time to grab a stockpot and start cooking soup. Get equipped to prepare delicious seasonal soups ranging from just-like-Mom’s Chicken Noodle to a hearty Leek and Potato soup using these five essential soup-making kitchen gadgets from HIC, Harold Import Co.
From potatoes and squash to onions and beef, the HIC Food Mill (4603) lets you prepare ingredients for soup with just a quick turn of the large crank handle. Its large, 2-qt. capacity and sturdy 18/8 stainless steel construction helps force food through the blades directly into the pot or bowl. Comes with four blades. We love soup with dumplings, and the HIC Spätzle Maker (1618) is the perfect tool for making these tasty little German noodles and depositing them directly into the broth for cooking. 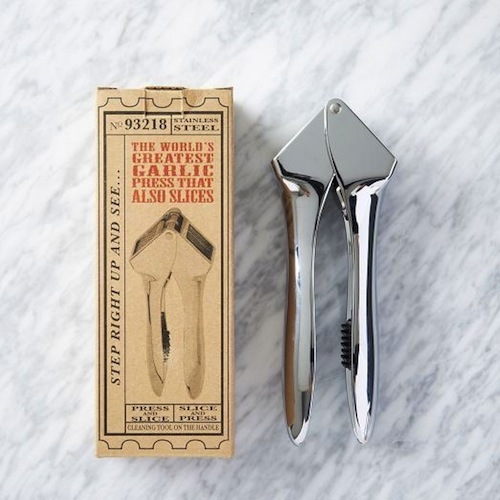 The World’s Greatest Garlic Press (93218) pulls double duty when effortlessly slicing and crushing garlic. And, the easy to clean design (a cleaning tool is included) makes it nearly fuss-free when removing excess garlic after use. The HIC Food Scoop (43751) transports chopped and diced ingredients during food prep. 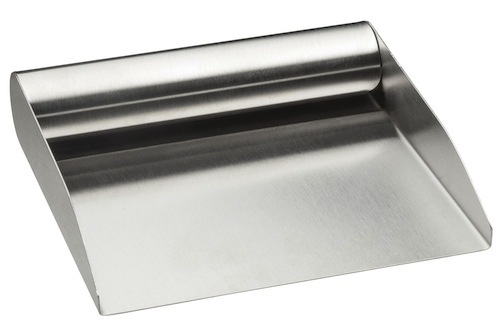 Designed to lay flat against work surfaces, and to scoop up foods and place directly into the soup stock. 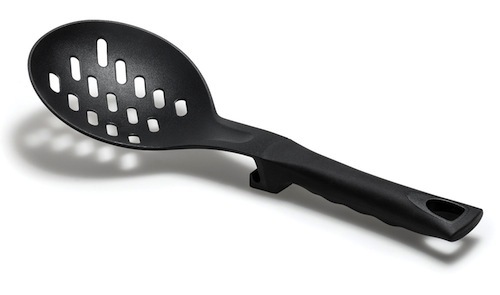 HIC’s Oversized Slotted Spoon (70001) is made from FDA-approved virgin nylon that is heat resistant to 390°F. Use to stir soup or to scoop out extra vegetable chunks into the bowl. The ergonomic handle has a soft grip and a small hook on the back of the handle allows the spoon to hang on the side of the bowl, or serve as a spoon rest. Check out these and hundreds of more Soup Season essential kitchen utensils from HIC, Harold Import Co. This entry was posted in Useful Tools and tagged food prep equipment, kitchen accessories, kitchen gadgets, kitchen housewares, kitchen utensils, Soup, Tools Exclusively from HIC Harold Import Co., Vegetable tools on September 15, 2015 by HIC, Harold Import Co..